In some ways I think this bike is going to be far too much of a performance bike for some in the cruiser market. It’s very, very fast and quite firmly sprung but rarely harsh. 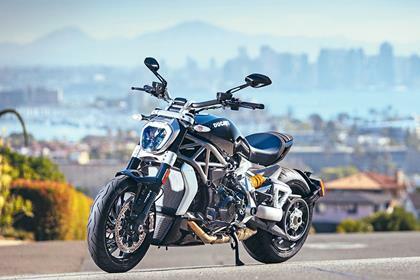 If you’ve always liked the idea of a cruiser but were never prepared to put up with the performance, handling and braking compromises most entailed, then the XDiavel is perhaps perfect for you. 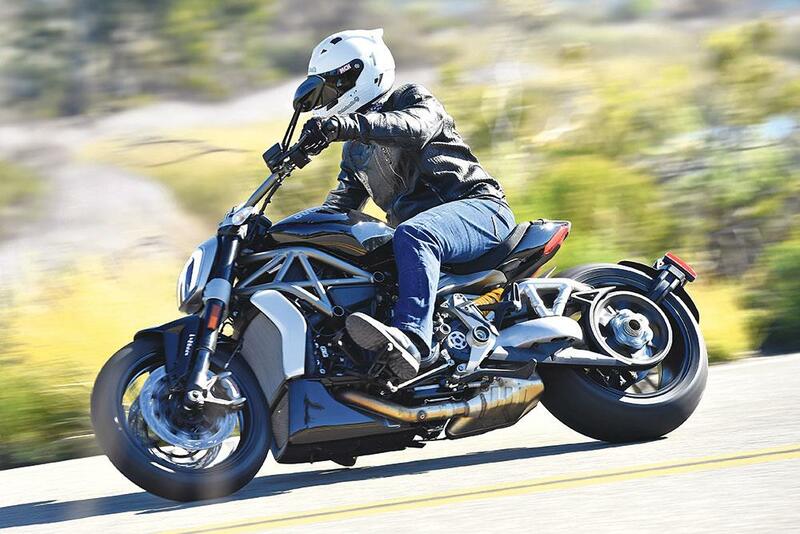 The XDiavel is a revelation for the cruiser market in terms of the handling prowess, available performance and the full complement of technology as standard. It’s blisteringly quick, has masses of torque for easy riding, looks amazing and has the right feet-forward and belt-drive components for the class. It has become the bike the original Diavel probably always should have been. On the move that length just never becomes an issue. It still handles, goes and stops like a real Ducati and the new 1262cc version of the Testastretta V-twin has thumping torque to make riding on the road easy. The 1262cc, 156bhp V-twin installed in the XDiavel is essentially a new engine when compared directly to the Diavel or Multistrada 1200 DVT. The 1262 DVT motor produces peak power of 153bhp at a lowly 5000rpm. The torque peaks at 95ftlb but it produces 72ftlb at just 2000rpm! 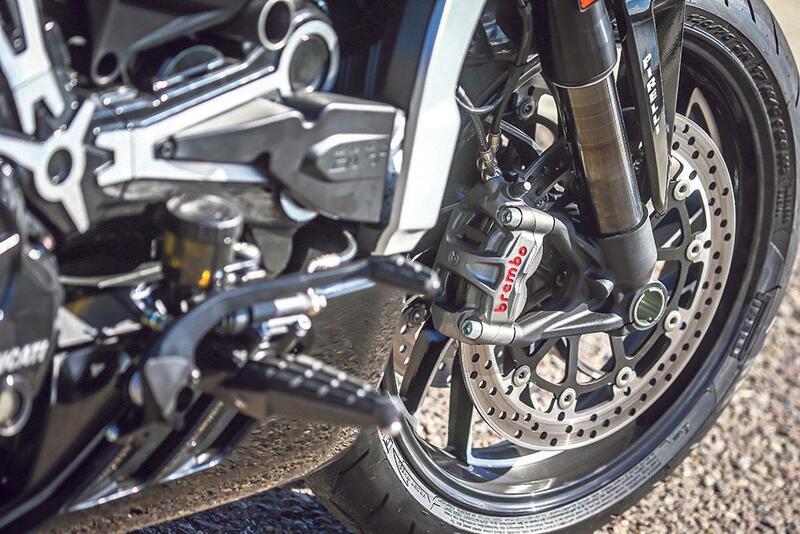 The engine has the Desmodromic Valve Timing (DVT) system first seen on the Multistrada 1200 DVT last year. The hydraulic variable valve timing system has been designed to take the lumpiness and piston slap out of the motor, smooth off the revs low down and make low speed riding more comfortable. 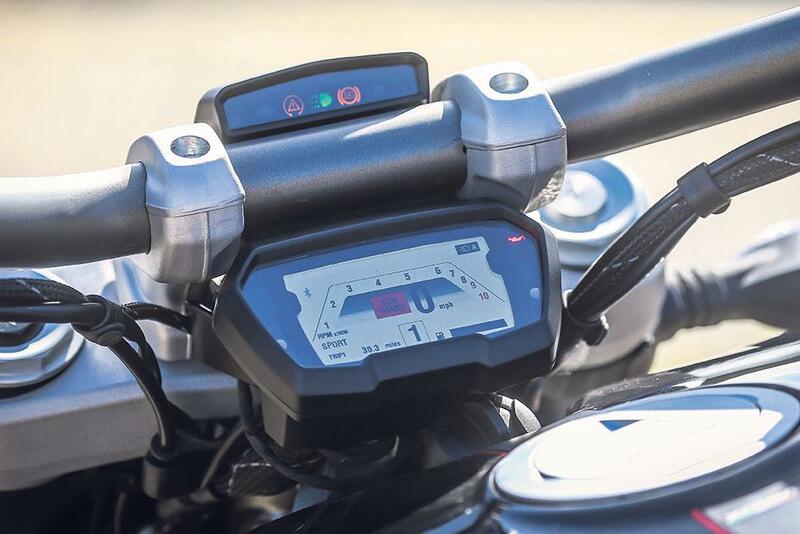 While the hardware of the DVT system remains the same, the way it has been programmed to work has been retuned for the XDiavel. The build quality on the XDiavel is top-notch and the more expensive and higher-specification S model takes this to another level again. The diamond cut rear wheel, different engine case finish and a host of other cosmetic changes set the bike apart from the standard bike and in the UK market is expected to make up around 80% of sales. 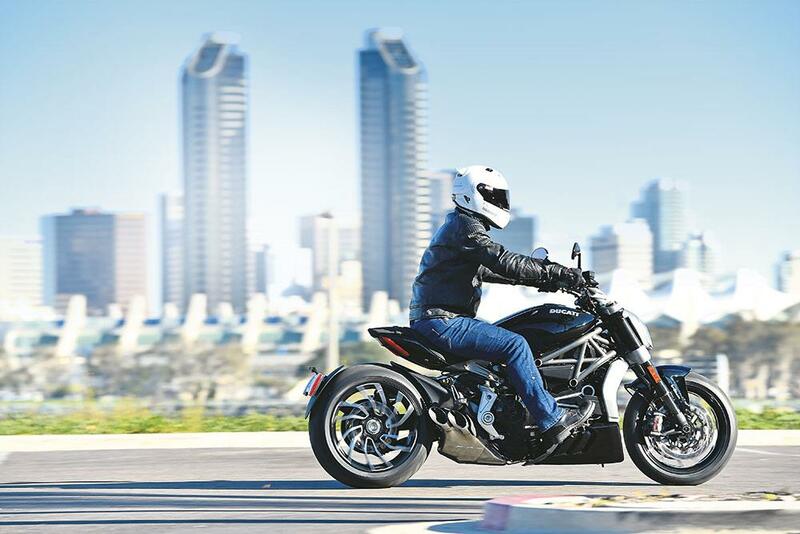 There’s no getting away from the fact the entire Diavel and XDiavel range are expensive bikes but that’s never stopped anyone from buying Ducati’s before. We don’t think they are necessarily overpriced as the equipment and quality of the bikes, along with the available performance and handling do make them class competitive. When you look at the cost of a Yamaha VMAX or a top line Harley-Davidson cruiser then the price looks more reasonable. Combined with the new motor is a full complement of electronic control systems including cornering ABS, traction control, anti-wheelie, three riding modes, cruise control and Ducati Power Launch which is a three-mode launch control system. It all seems a very long way from the simplicity of a Harley-Davidson cruiser for sure. There are three different handlebar options, five different seats and three footrest mounting points which Ducati says offers so many ergonomic options for maximum comfort. Seat height is just 755mm which offers even those of a shorter leg the option to be able to get feet onto the floor easily. 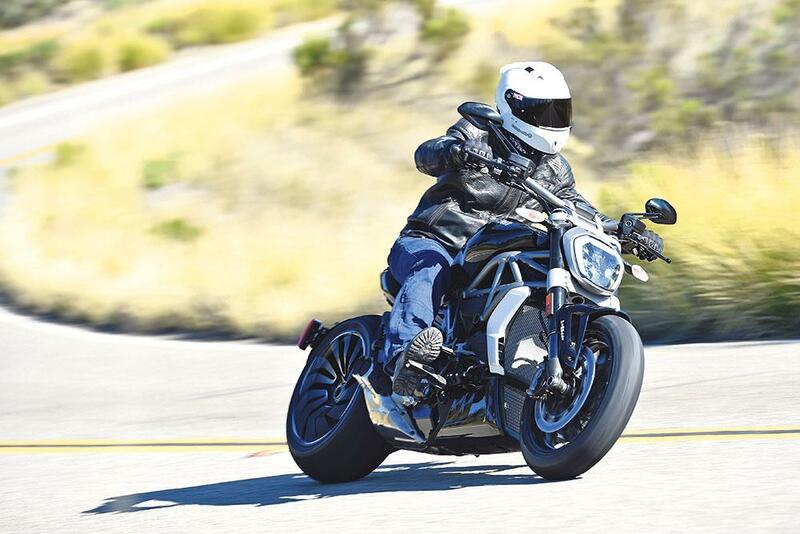 5 owners have reviewed their DUCATI XDIAVEL (2016-on) and rated it in a number of areas. Read what they have to say and what they like and dislike about the bike below. 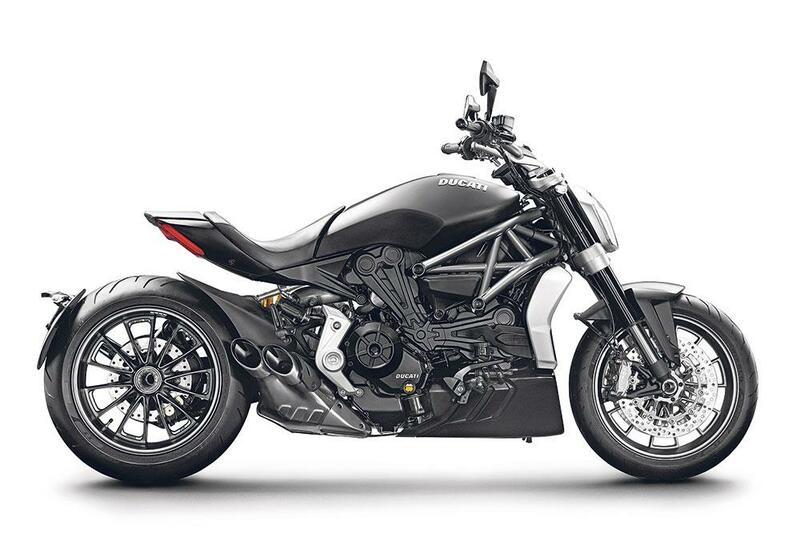 Engine is best ever- powerful & torquey and Diavel's design is so attractive and cool. Can travel all day long so comfortable. Ducati Manchester servicing team are great value, informative and do high quality work. Handsome glossy black tank and all bike's machined detail e.g diamond-cut rear wheel. Manchester Ducati ... Martin and Mike are super helpful, as are whole team like Andy in parts and Martin in servicing dept. Wolf in black sheep clothing. Forget all your chopper preconceptions this is like nothing else i've ever ridden. Fantastic engine and aesthetics, puts a massive smile on my face every time i ride it. Riding position is comfortable but very upright on the spine, at standard settings the rear shock is too soft and hitting pot holes or unexpected bumps can send jolts straight up your spine. Easily sorted with adjusting the pre-load. I have always ridden sports bikes and used to race in my youth, but have always had a go on choppers that friends and family own. Without trying the pegs or exhaust would always go down on the first corner or roundabout. 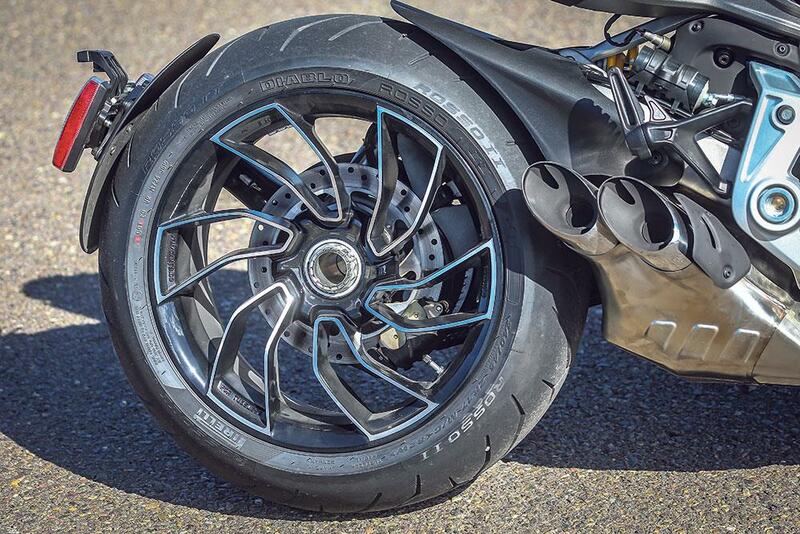 The XDiavel goes and stops like a sports bike, i have yet to scrape a peg so it leans plenty enough for the road, edge of the rear tire riding isn't a worry even with a 240 rear tire. It totally changes your performance preconception of a chopper. Passenger comfort isn't great even with the bigger passenger seat and back rest fitted. The engine heat is transferred to both rider and passenger in traffic, so much so the Mrs said it was boiling her chuff on a trip into Oxford in the summer. I love the matt black and gun metal grey but the tank picks up finger prints with ease. For me the standard model is the best looking as there are too many different colours on the S. The frame and swinging arm are different and the gloss black and polished metal paint look messy to my eye. Soft rear shock as standard, definitely need to wind on the pre-load, the rider foot pegs can be placed in three positions as standard and all three are comfortable so its just a matter of trying them and going with what feels best. There are factory options for 3 different bar lengths and different seat height if your not happy. I had a set of custom bars made to move my upper body from vertical to lent forwards as i have always ridden sports bikes. The vertical spine position was causing me issues with bumps (bad back from a bad crash in my youth) and now i have natural shock absorption as the hips are not under my shoulders. I find the bike very comfortable and can cope with long trips to the coast with ease. Brakes like a sports bike and abs and cornering abs as standard, the levels of which can be adjusted. Issues with air trapped in the rear brake causing excessive rear travel until no rear brake. I've had a new rear master cylinder under warranty and had several bleeds but so far nothing has sorted this permanently. The engine is a monster, 156bhp. Pulls like a train. Max torque is at 5000rpm and even in top gear at 80mph - 5000rpm if you crack the throttle wide it accelerates like my old CBR in first. It's not only power though i find it smooth for a twin, you can ride it low in the rev range like a traditional chopper and get great fuel consumption, but it does love the rev's. It is defiantly a proper Ducati, when ridden hard it doesn't disappoint. It's a sport bike destroyer at the traffic lights and the acceleration and torque are additive. I fitted a set of Arrow cans to it and the sound of the engine is obscene, it screams at you and the overrun on a closed throttle never ceases to put a smile on my face. Had stone pick up on the drive belt which then caught in the pulley cover damaging the belt. The rear brake has been problematic from the day i bought it, loosing pressure and gaining extra travel until there is no back brake. This is due to air in the system and even with a new bleeding procedure i am not convinced the issue has been sorted. I've had a new rear master cylinder and several bleeds of the system so i guess only time will tell. Had a small gasket failure on the rear cylinder and there are some hard starting issues which seam to be when the weather changes between putting away and next ride. Yes the bike is expensive at over £16k, but what a bike. Service intervals are 9k miles so that is good but the annual service if the mileage isn't hit, filter and oil change cost me £250. Will be doing home services once the warranty expires but have yet to find a permanent way of turning off the service warning without the Ducati code reader. Had a damaged drive belt which cost me £400+ 240 section rear tire isn't going to be cheap to replace and you can go through them rather quickly if you have a heavy right hand. Fuel consumption can be brilliant, i have had over 75mpg on some distance rides, over 220 miles from a tank. Pulling away from a standstill is what kills the high mpg. If you enjoy the rev's and acceleration too much this can be down in the low 40's but if i'm in that kind of mood i'm happy to take the smiles to pounds hit in the wallet for the fuel. Lots of stuff as standard, traction control and cornering abs with 10 setting levels. 3 different power modes though mine is never out of full fat sports mode. Launch control and anti wheelie Standard small passenger seat for when you're on your own, larger rear seat and back rest for when you want to take passengers. Dashboard has different views/layouts, depending on what you want to see. Love the back lit switches on the handle bars. Keyless ignition is great as you can ride and stop, lock the steering all without having to take a key with you (key pad entry) or having to take the key out of your pocket, but as standard you need the key for the fuel tank. Standard end can is heavy and keeps the bike quiet. No baffle removal option and once changed the exhaust note is so much better what ever option you chose. I have the Ducati alarm and immobiliser which has been trouble free. Also have an optimate charge plug fitted by the dealer free of charge. I have had fantastic customer service from Riders of Bristol, though a couple of issues were missed on pdi. Had the handle bars set too low and damaged the tank (chipping the paint) on the first ride. The petrol tank was replaced free of charge. There were scratches on the engine case like a tool had been run over the engine while fitting the rear cylinder. Had the engine removed and painted over winter again free of charge. Paid full price as there were no deals on the new model as they were selling well. I had only gone in to blag a test ride as i'd fallen in love with the looks from the pictures. Was given a test ride with no messing around, hadn't really intended to buy but wanted to try, that test ride blew me away and i had to have the bike. Had a few little freebies thrown in and always happy to see me when i go in to the store, had a number of bikes out when mines been in for service. First Ducati i have owned, so far its always put a smile on my face every time i take it out. Never get tired of hearing the engine growl, it pulls forever. Cheap to run unless you are in 'sport' mode, drinks fuel on this setting. Its got almost everything, although heated grips would have been nice. Dealer was great (Alton Ducati), kept me up to date on arrival of bike. Too old for sports bikes now and on to cruisers, this is the first one that ticks every box, you can cruise on it chilled out, or blast around, its fantastic. Again only have the standard XdIavel but brakes are still very good and apart from some minor movement over bumpy B roads very comfortable, as good as any naked. Only had bike 4 weeks, superb quality throughout. Even the standard version isn't cheap, but expect normal Ducati servicing costs. Even if giving the big motor some beans still getting good mpg. The seat/handle bar combination is very comfy, i am 6ft and standard setup is perfect. Wind blast not too bad for a cruiser but may need a screen in the future for very long high fast runs. Bought from Ducati Manchester, great customer service and attitude - unlike many other Ducati dealers i spoke to. Ultimate Cruising without the sea! Style, smoothness, with the full grunt of serious power. Most reviews state Ducati have taken the cruiser to a different level, I can only confirm this, the bike handles with ease and holds an awesome responsive power unit, which can be unleashed in controlled manner. Style, well just look! Core features are superb, only fault is no heated handle grips for the nesh like myself.